Nice pearl jasmine with fresh leaves and good scenting. Smooth, sweet, and delicate. 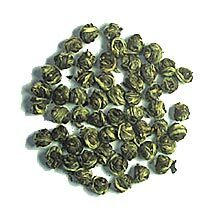 Te Ji Pearl Jasmine is frothier, richer, more complex, but this pearl jasmine is nevertheless a good quality jasmine tea. Highly recommended! Good everyday tea. Like it. Good everyday tea. Like it. Good everyday tea. Like it. Good everyday tea. Like it. Good everyday tea. Like it. As I’m new to the tea culture (only about 4 years into it) I am very pleased by the taste and quality of the Pearl Jasmine that I received. The tease and brewing was very pleasant and I would recommend this tea to anyone that wants’ a good quality tea for a good price. I´m new to the Green tea and Peral Jasmine tea´s. As I know as a newbie. The pearl jasmine that is sold here is the best I´ve found. newbie of tea drinking for 4 year CC. Tea drinking is something you just don´t pick up over night. Хорошее соотношение цена-качество. Класический зеленый чай. Насыченый вкус и аромат. Рекомендую! An excellent jasmine tea for the price offered! Although the tea leaves are not as white or downy as some of the higher quality (and price!) offerings on this website and elsewhere, the tea is still deliciously aromatic. I brewed it with boiling water and enjoyed it very much as a robust, scented tea. Great jasmine tea. I will give it "5", but Te Ji Pearl Jasmine is - for me - better, this one is little too strong, but still very good, especially for several brewings. I´m not a really big fan of jasmine teas, but I do drink them occasionally. This is one of the best I´ve had. Very nice aroma and flavor. The aroma is really a mix of jasmine and tea, rather than just jasmine. Насыщеный вкус и аромат. Теряет вкус при заваривании кипятком. Very good jasmine pearl tea, I usually brew it for a little longer than usual to maximize jasmine taste. Good price / quality ratio. The classic green tea. Nasycheny taste and aroma. Recommended! You can get upwards of 3 delicious infusions with this tea. A must have for jasmine lovers. I love the fragrance and delicate taste of the lovely tea. This is an excellent pearl jasmine tea, especially for the price! Well-balanced and mild... absolutely delicious. I will certainly be ordering this again! Sweet and refreshing. Love to drink it in the morning for a delicious pick me up or as an after meal treat. Этот чай имеет вкус и запах жасмина, но самого жасмина нет. Фантастика. tastes and smells great, a wonderful classical green tea. Really good one. Very mild taste, lasts for several infusions. It so differs from low-cost jasmine flavoured green teas! wonderful jasmine tea. This is how i introduce others to tea. Een grote jasmijnthee waar wel een zestal aftreksels uit verkregen kunnen worden. Mooie neus en goudgele infusie. I enjoyed this tea alot. Nice aroma, good for relaxing. Good tea,a classical chinese favorite one of my favorite if you know how to brew it right it makes an excellent. Great tea, great service. Thet let me know when one was out of stock, and recommended another. It´s a good Jasmine tea with a attractive aroma and taste. Just got it in mail. Excellent tea with a very nice aroma and good taste. Best of jasmine scented teas I´ve tried. Gorgeous green tea and jasmine pearls that make a smooth and inviting tea. Especially good in spring time! Great aroma and taste. Pearl Jasmine is a must-try for any tea lover. Green jasmine tea is always a pleasure. a tea for every moment. Fragnant tea with a gently taste. Very good after a stodge because of it refreshing effect. Delicious tea, very tastfull. Large, rich taste. You can drink it throu the whole day. I LOVED this tea, it has a sweet aroma and gorgeous lingering after-taste. I really enjoyed it and will be ordering more! Very good Pearl Jasmine. The smell and taste of Jasmine is very strong, and it is really beautiful to see the pearls unweaving into the leaves. Good quality though its tea bud is smaller than your Te-Ji one and is with less white down. One of the best jasmines that i have had. Great quality tea. I ordered this tea again because it is so excellent. I intend to keep doing it. Great tea. Easy to drink, and great delivery service. Tea was excellent. The service continues to be excellent. This tea has more Jasmine flavor than any I have tried. It is beyond excellent! Fascinating to smell, drink and look at. Very good, great classic. An easy way too impress friends and family. One of my favorite flavored greens. A perfect tea for late afternoon. SO tasty, and stands up to many brewings. This is our all time favorite! The ultimate jasmine tea... Not only a pleasure to drink, but to see as well.